After nearly 60 years of charitable commitment to the communities it serves, Jack’s Restaurants has launched its own separate non-profit foundation to continue its longtime commitment to community support. 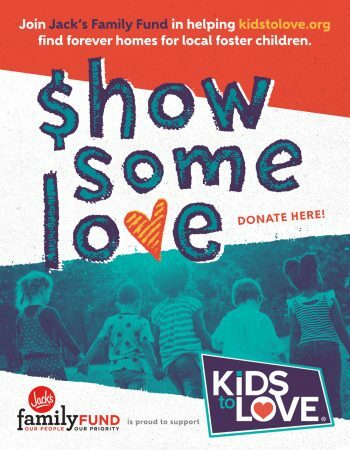 The Jack’s Family Foundation kicked off with the annual eight-week “Show Some Love” campaign in Jack’s Restaurants. The campaign featured a number of events, including car washes, spirit nights, and motorcycle rides to collect donations. In the last two years, the campaign raised $178,000 and $157,000, respectively. This year, Jack’s Restaurants surpassed those numbers by a wide margin, as customers and employees in 157 stores raised $217,000 – the most Jack’s Restaurants has ever raised in a single philanthropic effort. Proceeds from the campaign, which ran from August 8 to September 25, will benefit Kids to Love, a Huntsville organization dedicated to helping Alabama children in foster care. Jack’s has been working with Kids to Love for the past eight years; three years ago, Jack’s made Kids to Love their annual companywide fundraiser. On October 17 at 1:00 p.m. at Davidson Farms, Kids to Love will receive a $217,000 check from Michael Greco, Chairman of the Board of Jack’s Family Fund, and Christy Malone, Jack’s Restaurants Brand Manager. For more information, or to cover this event, contact Christy Malone at 205.201.7809 or cmalone@eatatjacks.com. Every dollar makes a difference. Partner with the Jack’s Family Fund to start making a difference in our communities today!